Aloethe’s life is taken by a jealous prince; Aloethe’s love, Varka, serves as a scapegoat to the murder. Sentenced to sacrifice at the temple of the Darxes, Lord of the Underworld, Varka awakens and is encouraged to find Aloethe in Limbo … if he can find the place. Varka is also empowered with the Book of Paradox, a magical book with pages/verses are cryptic, dynamic, and crucial to understand. 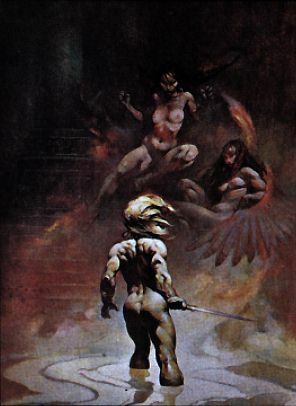 Louise Cooper was only twenty years old when her debut novel came out, and she was graced with a breath-taking Frank Frazetta cover (called “Paradox”). Each chapter has a frontispiece with an illustration by Barbara Nessim of the card influence in the current chapter along with a paragraph explaining the interpretation. Many mini-stories span 2-to-3 cards/chapters; for instance, the cover of Varka approaching vampire women is a scene from a story spanning (a) Chapters VII: The Chariot (Reversed) and (b) VIII: Fortitude. This is a trippy adventure into an underworld that is more dream-like than it is horrifying. It is short and reads fast. The pacing and style is reminiscent of Michael Moorcock (known for his Elric novels) and there are some echoes of Jack Vance (1926-2013) and his Dying Earth series--iconic in RPG/D&D history since the naming of Items and Spells was simple: Magic Items such as Expansible Egg, Scintillant Dagger, and Live Boots...and Spells such as Excellent Prismatic Spray, Phandaal's Mantle of Stealth, Call to the Violent Cloud, Charm of Untiring Nourishment. There is an echo of Vance flare here, in that Louise Cooper offers location and titles similarly: Castle Without parallel, Queen of Blue, the Cave of Souls Passing, and the titular Book of Paradox. The Tarot design is interesting but not obviously crucial/integral for the story; i.e., the Book of Paradox carried by Varka begged for a stronger connection to the Tarot cards, but the connection, if any, was not obvious. Nonetheless, it is a fun tale. Louise seems better known for her Time Master and Indigo series, which I plan to read.